This is a much-needed and authoritative account of Common Buzzards gained from extensive studies by the author over 60 years and also from enthusiasts in this country and across northern Europe. The accounts describe the life history and ecology of Buzzards mainly inhabiting the British uplands where historically they have always been most numerous. For the first time, population activities are followed through successive seasonal stages of their life cycle. These include the vital and inter-related aspects of Buzzard territories and social behaviour, diets and hunting methods, food requirements, prey abundance and breeding success, survival and life spans and how Buzzard numbers and distribution have changed, particularly in relation to the influence of Man. The book also demonstrates how well Buzzards have adapted to living in our modern and rapidly-changing landscapes, constantly adapting their habits in response to prey resources and environmental conditions. 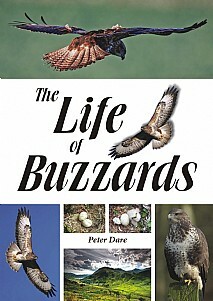 In the book’s first section, The Year of the Buzzard, the sequential changes in the composition and behaviour of a Buzzard community, their seasonal patterns of food habits and hunting methods, their breeding season from courtship until fledging of broods and their subsequent dispersal are outlined. The second section, Special Topics, provides greater detail of six key aspects of their ecology which are explored within the following chapter topics: Territory; Energy and Food Needs; Predation; Food Supply and Breeding Success; Demography and Population Dynamics; and Changes in Buzzard Abundance. This is essential reading for all raptor ecologists and enthusiasts, conservation bodies, landowners with game-rearing interests and other land managers as well as everyone with an interest in birds, conservation and wildlife.